A well maintained chimney essential to an home's weatherproofing qualities and stability. Even if you don't have a fireplace, chances are you've got a chimney. Older homes in particular have chimneys that vent a gas furnace or water heater. These chimneys are just as important to your home's comfort and proper operation as the furnace itself and should be inspected to make sure they are in good repair. GF Sprague has been providing chimney maintenance, repair, replacement and chimney installation in Massachusetts for over 45 years. We have skilled masons and craftsman on staff who can fix nearly any type of chimney problem. If you have a chimney problem that you need fixed, call us or click below to request a free estimate in Newton, Needham, Wellesley or nearby. Our technicians will evaluate your situation and recommend the best solution for your needs. This project was focused on fixing a leak in a brick chimney. While the bricks are a bit worn, the real issue was the flashing around the base which had completely deteriorated. The new copper flashing will solve this leak problem and it looks great too. This homeowner called us as they had noticed some damage to the chimney and wanted to have it looked at. Upon our certified expert's inspection, he saw that the bricks were beginning to crumble and the mortar was worn out in a few places, which could lead to leaks. It was clear that the chimney was beyond repair, so it had to be taken down a few courses and rebuilt. At this project in Newton we completely re-did the chimney from the roofline up along with new flashing. The old chimney was leaky and the bricks had begun to deteriorate so we removed the old brick and replaced it with new brick. This chimneys lead flashing had deteriorated so we removed and replaced with new lead flashing underlayed with copper. Most homeowners understand the need to inspect their roofs, gutters, and siding for damage and wear, but they forget about the chimney. Yet the chimney is exposed to the same weather conditions and elements as the rest of the home's exterior. That means it needs regular inspection too. Failure to inspect a chimney regularly can turn minor repair jobs into major chimney replacement, leading to a potentially significant investment. Chimney repair is a critical component to maintaining a watertight room system. Failure to keep water from penetrating your home through compromised chimney areas not only puts your home's interior at risk but can infect other areas of the exterior envelop as well. Obstructions: Chimney obstructions are a fire hazard. The blockage may be physical or there may not be enough updraft to draw smoke out of the home. Either way, the obstruction needs to be removed or you risk carbon monoxide poisoning. Creosote build-up: Creosote is found in smoke and adheres to the walls of the chimney. Over time, it can build up and cause chimney fires. Flue cracks: The flue is the chimney lining, which gets a lot of abuse from heat, smoke, and deposits of flammable creosote. This lining protects the rest of the home from heat and fire. If cracks develop it creates an access point for smoke, heat or fire to damage the interior of the home's structure. Crumbling or missing mortar: Years of exposure can cause mortar to crumble and disconnect from the chimney. Tuckpointing fixes the problem by removing damaged mortar and replacing it with fresh new mortar, increasing the strength and stability of the chimney. Brickwork problems: Bricks can fall out, crack or weather away. 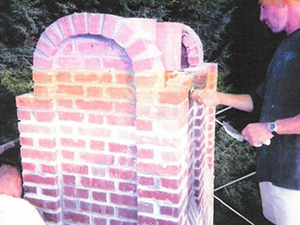 We replace broken and damaged bricks to ensure the structural integrity of your chimney. Broken crowns and caps: The crown is the top edge of your chimney. A cap covers the actual chimney opening. Both need regular inspection to keep water out. Caps are also a good deterrent to keep animals and debris out of the chimney. Flashing problems: Chimneys need to be flashed properly to direct rain and snowmelt away from the base of the chimney and down the roof. If water sits at the base of the chimney it can wear away at the mortar and cause structural problems with the chimney. Flashing may be non-existent or it may have come loose or been damaged in a storm and require repair. Word to the wise: Blank gunk does not count as flashing or a proper protective barrier against water penetration and is a telltale sine that there is an issues which lies below! If you've noticed crumbling mortar around your chimney or in your gutters, your chimney needs an inspection. Contact GF Sprague for a complete chimney inspection to make sure there isn't any water damage or areas where water can enter the roof as a result of a damaged chimney. Call us at 1-781-209-6791 to arrange a chimney inspection or for chimney repair for your home in Newton, Needham, Wellesley, Chestnut Hill, Weston, Boston, Brookline, Quincy, Watertown, Cambridge and nearby!